The Augsburg University Education Department and the State of Minnesota Board of Teaching require preservice teachers to engage in pre-student teaching activities in urban K-12 schools. These experiences are an important part of preparing licensure students for the rigors of full-time K-12 teaching. The Education Department maintains a Moodle site for current teacher candidates to access field experience resources such as information about placement requests, background checks, and professional responsibilities. In order to receive credit for field experience, you will need to register your placement and submit your binder, which includes your hours log, in Tk20. Students must look up the demographics of each school on the Minnesota Report Card every semester and enter the information in Tk20. We encourage students to consider a placement in one of our Partner Schools as we work on impacting P-12 education through enhanced collaboration; we also believe that the Augsburg student experience is enhanced at our partner schools. 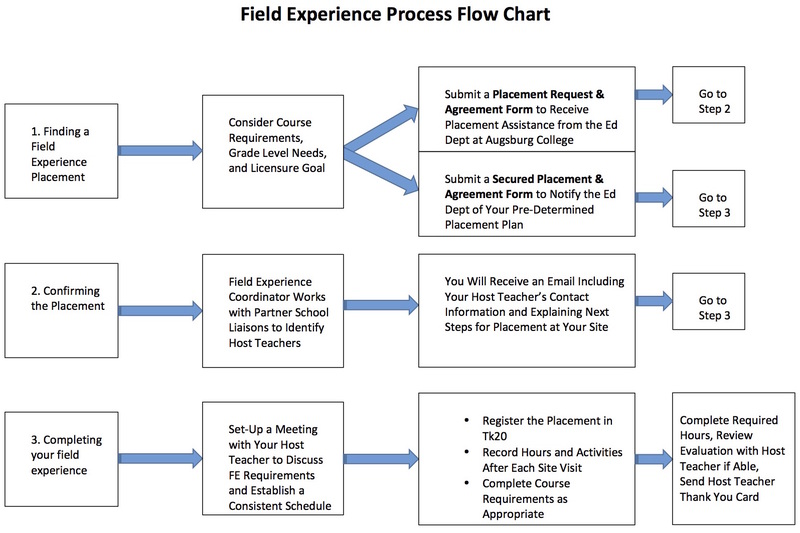 The use of field experience and service-learning in the Augsburg University teacher licensure program is based on a pedagogical model of knowledge and skill development developed at the university in the 1990’s. Selected courses requiring field experience will follow the Augsburg service-learning model. This model has been used by many colleges and universities around North America. Click here to read more about Augsburg’s S-L Integration Model. A web site with definitions, examples, forms, and resources is also available. It is called: Service-Learning: A Pre-Service Teacher’s Guide. At several points within the licensure program, each student’s field experience is assessed and documented. This documentation becomes part of the licensure student’s file in the Education Department and are required for licensure.